There are painfully few gynecologists that specialize in treating pelvic and sexual pain disorders. You might be surprised to hear that doctors are not taught this information in medical school or residency training. Dr. Angie Stoehr, an OB-GYN practicing in Texas, is desperately trying to change this. 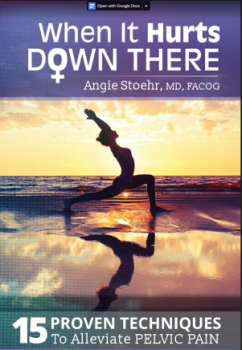 She has written this book to help educate you and your doctor about pelvic pain that originates from IC, pelvic floor dyfunction, endometriois, IBS and vulvodynia. She then describes, in detail, how you can reduce your pain levels by interfering with the pain signals in your pelvis and brain. Included are 15 specific techniques with detailed instructions. 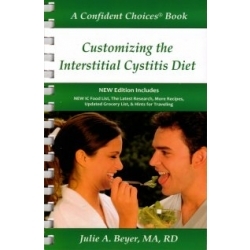 This book will introduce you to your body’s way of recognizing and transmitting pain signals. It will give you a tour of your brain and how it manages to process and make sense of the pain signals it is receiving. The author then shares how to halt many of these processes with easy, at-home techniques that work. You don’t need a doctor to tell you where your pain is coming from before you can start the techniques described in this book. Dr. Angie Stoehr provides detailed explanations of the techniques, and tells you WHY they work. And she gives plenty of examples of how to do the techniques properly. No more being told it’s all in your head. You can do something about your pain, right now! The ideas and explanations in this book are scientifically proven. There are over 80 medical literature articles included, and diagrams and color pictures to show you how things really work.